For other uses, see University of Prague (disambiguation). Charles University, known also as Charles University in Prague (Czech: Univerzita Karlova; Latin: Universitas Carolina; German: Karls-Universität) or historically as the University of Prague (Latin: Universitas Pragensis), is the oldest and largest university in the Czech Republic. Founded in 1348, it was the first university in Central Europe. It is one of the oldest universities in Europe in continuous operation and ranks in the upper 1.5 percent of the world’s best universities. Today, the university consists of 17 faculties located in Prague, Hradec Králové and Pilsen. Its academic publishing house is Karolinum Press. The university also operates several museums and two botanical gardens. 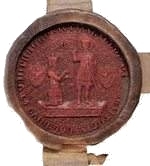 Its seal shows its protector Emperor Charles IV, with his coats of arms as King of the Romans and King of Bohemia, kneeling in front of St. Wenceslas, the patron saint of Bohemia. It is surrounded by the inscription, Sigillum Universitatis Scolarium Studii Pragensis (English: Seal of the Prague academia). 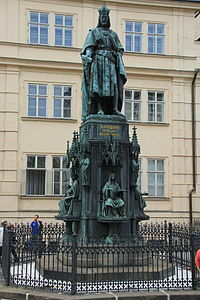 The establishment of a medieval university in Prague was inspired by Holy Roman Emperor Charles IV. He asked his friend and ally, Pope Clement VI, to do so. On 26 January 1347 the pope issued the bull establishing a university in Prague, modeled on the University of Paris, with the full (4) number of faculties, that is including theological. On 7 April 1348 Charles, the king of Bohemia, gave to the established university privileges and immunities from the secular power in a Golden Bull and on 14 January 1349 he repeated that as the King of the Romans. Most Czech sources since the 19th century—encyclopedias, general histories, materials of the University itself—prefer to give 1348 as the year of the founding of the university, rather than 1347 or 1349. This was caused by an anticlerical shift in the 19th century, shared by both Czechs and Germans. The university was opened in 1349. The university was sectioned into parts called nations: the Bohemian, Bavarian, Polish and Saxon. The Bohemian natio included Bohemians, Moravians, southern Slavs, and Hungarians; the Bavarian included Austrians, Swabians, natives of Franconia and of the Rhine provinces; the Polish included Silesians, Poles, Ruthenians; the Saxon included inhabitants of the Margravate of Meissen, Thuringia, Upper and Lower Saxony, Denmark, and Sweden. Ethnically Czech students made 16–20% of all students. Archbishop Arnošt of Pardubice took an active part in the foundation by obliging the clergy to contribute and became a chancellor of the university (i.e., director or manager). In the Western Schism, the Bohemian natio took the side of king Wenceslaus and supported the Council of Pisa (1409). The other nationes of the university declared their support for the side of Pope Gregory XII, thus the vote was 1:3 against the Bohemians. Hus and other Bohemians, though, took advantage of Wenceslaus' opposition to Gregory. By the Decree of Kutná Hora (German: Kuttenberg) on 18 January 1409, the king subverted the university constitution by granting the Bohemian masters three votes. Only a single vote was left for all other three nationes combined, compared to one vote per each natio before. The result of this coup was the emigration of foreign (mostly German) professors and students, founding the University of Leipzig in May 1409. Before that, in 1408, the university had about 200 doctors and magisters, 500 bachelors, and 30,000 students; it now lost a large part of this number, accounts of the loss varying from 5000 to 20,000 including 46 professors. In the autumn of 1409, Hus was elected rector of the now Czech-dominated rump university. Cardinal Ernst Adalbert von Harrach actively opposed union of the university with another institution and the withdrawal of the archepiscopal right to the chancellorship and prevented the drawing up of the Golden Bull for the confirmation of the grant to Jesuits. Cardinal Ernst funded the Collegium Adalbertinum and in 1638 emperor Ferdinand III limited the teaching monopoly enjoyed by the Jesuits. He took from them the rights, properties and archives of the Carolinum making the university once more independent under an imperial protector. During the last years of the Thirty Years' War the Charles Bridge in Prague was courageously defended by students of the Carolinum and Clementinum. Since 1650 those who received any degrees took an oath to maintain the Immaculate Conception of the Blessed Virgin, renewed annually. On 23 February 1654 emperor Ferdinand III merged Carolinum and Clementinum and created a single university with four faculties—Charles-Ferdinand University. Carolinum had at that time only the faculty of arts, as the only faculty surviving the period of the Hussite Wars. Starting at this time, the university designated itself Charles-Ferdinand University (Latin: Universitatis Carolinae Ferdinandeae). The dilapidated Carolinum was rebuilt in 1718 at the expense of the state. The rebuilding and the bureaucratic reforms of universities in the Habsburg monarchy in 1752 and 1754 deprived the university of many of its former privileges. In 1757 a Dominican and an Augustinian were appointed to give theological instruction. However, there was a gradual introduction of enlightened reforms, and this process culminated at the end of the century when even non-Catholics were granted the right to study. On 29 July 1784, German replaced Latin as the language of instruction. For the first time Protestants were allowed, and soon after Jews. The university acknowledged the need for a Czech language and literature chair. Emperor Leopold II established it by a courtly decree on 28 October 1791. On 15 May 1792, scholar and historian Franz Martin Pelzel [cs] was named the professor of the chair. He started his lectures on 13 March 1793. It soon became clear that neither the Germans nor the Czechs were satisfied with the bilingual arrangement that the University arranged after the revolutions of 1848. The Czechs also refused to support the idea of the reinstitution of the 1349 student nations, instead declaring their support for the idea of keeping the university together, but dividing it into separate colleges, one German and one Czech. This would allow both Germans and Czechs to retain the collective traditions of the University. German-speakers, however, quickly vetoed this proposal, preferring a pure German university: they proposed to split Charles-Ferdinand University into two separate institutions. After long negotiations, Charles-Ferdinand was divided into a German Charles-Ferdinand University (German: Deutsche Karl-Ferdinands-Universität) and a Czech Charles-Ferdinand University (Czech: Česká universita Karlo-Ferdinandova) by an act of the Cisleithanian Imperial Council, which Emperor Franz Joseph sanctioned on 28 February 1882. Each section was entirely independent of the other, and enjoyed equal status. The two universities shared medical and scientific institutes, the old insignia, aula, library, and botanical garden, but common facilities were administrated by the German University. The first rector of the Czech University became Václav Vladivoj Tomek [de]. In 1890, the Royal and Imperial Czech Charles Ferdinand University had 112 teachers and 2,191 students and the Royal and Imperial German Charles Ferdinand University had 146 teachers and 1,483 students. Both universities had three faculties; the Theological Faculty remained the common until 1891, when it was divided as well. In the winter semester of 1909–10 the German Charles-Ferdinand University had 1,778 students; these were divided into: 58 theological students, for both the secular priesthood and religious orders; 755 law students; 376 medical; 589 philosophical. Among the students were about 80 women. The professors were divided as follows: theology, 7 regular professors, 1 assistant professor, 1 docent; law, 12 regular professors, 2 assistant professors, 4 docents; medicine, 15 regular professors, 19 assistant, 30 docents; philosophy, 30 regular professors, 8 assistant, 19 docents, 7 lecturers. The Czech Charles-Ferdinand University in the winter semester of 1909–10 included 4,319 students; of these 131 were theological students belonging both to the secular and regular clergy; 1,962 law students; 687 medical; 1,539 philosophical; 256 students were women. The professors were divided as follows: theological faculty, 8 regular professors, 2 docents; law, 12 regular, 7 assistant professors, 12 docents; medicine, 16 regular professors, 22 assistant, 24 docents; philosophy, 29 regular, 16 assistant, 35 docents, 11 lecturers. The high point of the German University was the era preceding the First World War, when it was home to world-renowned scientists such as physicist and philosopher Ernst Mach, Moritz Winternitz and Albert Einstein. In addition, the German-language students included prominent individuals such as future writers Max Brod, Franz Kafka, and Johannes Urzidil. The "Lese- und Redehalle der deutschen Studenten in Prag" ("Reading and Lecture Hall of the German students in Prague"), founded in 1848, was an important social and scientific centre. Their library contained in 1885 more than 23,519 books and offered 248 scientific journals, 19 daily newspapers, 49 periodicals and 34 papers of entertainment. Regular lectures were held to scientific and political themes. Even before the Austro-Hungarian Empire was abolished in late 1918, to be succeeded by Czechoslovakia, Czech politicians demanded that the insignia of 1348 were exclusively to be kept by the Czech university. The Act No. 197/1919 Sb. z. a n. established the Protestant Theological Faculty, but not as a part of the Charles University. That changed on 10 May 1990, when it finally became a faculty of the university. In 1920, the so-called Lex Mareš (No. 135/1920 Sb. z. a n.) was issued, named for its initiator, professor of physiology František Mareš, which determined that the Czech university was to be the successor to the original university. Dropping the Habsburg name Ferdinand, it designated itself Charles University, while the German university was not named in the document, and then became officially called the German University in Prague (German: Deutsche Universität Prag). In 1921 the Germans considered moving their university to Liberec (German: Reichenberg), in northern Bohemia. In 1930, about 42,000 inhabitants of Prague spoke German as their native language, while millions lived in northern, southern and western Bohemia, in Czech Silesia and parts of Moravia near the borders with Austria and Germany. In October 1932, after Naegle's death, the Czechs started again a controversy over the insignia. Ethnic tensions intensified, although some professors of the German University were members of the Czechoslovak government. Any agreement to use the insignia for both the universities was rejected. On 21 November 1934, the German University had to hand over the insigniae to the Czechs. The German University senate sent a delegation to Minister of Education Krčmář to protest the writ. At noon on 24 November 1934, several thousand students of the Czech University protested in front of the German university building. The Czech rector Karel Domin gave a speech urging the crowd to attack, while the outnumbered German students tried to resist. Under the threat of violence, on 25 November 1934 rector Otto Grosser [de] (1873–1951) handed over the insigniae. These troubles of 1934 harmed relations between the two universities and nationalities. The tide turned in 1938 when, following the Munich Agreement, German troops entered the border areas of Czechoslovakia (the so-called Sudetenland), as did Polish and Hungarian troops elsewhere. On 15 March 1939 Germans forced Czecho-Slovakia to split apart and the Czech lands were occupied by Nazis as the Protectorate of Bohemia and Moravia. Reichsprotektor Konstantin von Neurath handed the historical insigniae to the German University, which was officially renamed Deutsche Karls-Universität in Prag. On 1 September 1939 the German University was subordinated to the Reich Ministry of Education in Berlin and on 4 November 1939 it was proclaimed to be Reichsuniversität. On 28 October 1939, during a demonstration, Jan Opletal was shot. His burial on 15 November 1939 became another demonstration. On 17 November 1939 (now marked as International Students' Day) the Czech University and all other Czech institutions of higher learning were closed, remaining closed until the end of the War. Nine student leaders were executed and about 1,200 Czech students were interned in Sachsenhausen and not released until 1943. About 20 or 35 interned students died in the camp. On 8 May 1940 the Czech University was officially renamed Czech Charles University (Czech: Česká universita Karlova) by government regulation 188/1940 Coll. World War II marks the end of the coexistence of the two universities in Prague. Although the university began to recover rapidly after 1945, it did not enjoy academic freedom for long. After the communist coup in 1948, the new regime started to arrange purges and repress all forms of disagreement with the official ideology, and continued to do so for the next four decades, with the second wave of purges during the "normalization" period in the beginning of the 1970s. Only in the late 1980s did the situation start to improve; students organized various activities and several peaceful demonstrations in the wake of the Revolutions of 1989 abroad. This initiated the "Velvet Revolution" in 1989, in which both students and faculty of the university played a large role. Václav Havel—a writer, dramatist and philosopher was recruited from the independent academic community and appointed president of the republic in December 1989. Charles University does not have one joint campus. The academic facilities occupy many locations throughout the city of Prague and three of the faculties are located in other cities (two of them in Hradec Králové, one in Pilsen). The historical main building from the 14th century called Carolinum is situated in the Old Town of Prague and constitutes the university's center. It is the seat of the rector and of the Academic Senate of Charles university. Carolinum is also the venue for official academic ceremonies such as matriculations or graduations. The Botanical Garden of Charles University, maintained by its Faculty of Science, is located in the New Town. Among the four original faculties of Charles University were: the faculty of law, medicine, art (philosophy) and theology (now catholic theology). Today, Charles University consists of 17 faculties, based primarily in Prague, two houses in Hradec Králové and one in Plzeň. According to Academic Ranking of World Universities (Shanghai Ranking), Charles University ranked in the upper 1.5 percent of the world’s best universities in 2011. It came 201st to 300th out of 17,000 universities worldwide. It is the best university in the Czech Republic and one of the best universities in Central and Eastern Europe only overtaken by Russian Lomonosov Moscow State University at 74th place. It was placed 31st in Times BRICS & Emerging Economies Rankings 2014 (after 23rd University of Warsaw). According to QS Subject Ranking is Charles University among 51–100 best universities in world in geography and linguistics. In Germany the Charles University in Prague cooperates with the Goethe-University in Frankfurt/Main. Both cities are linked by a long-lasting partnership agreement. Prof. MUDr. Tomáš Zima, DrSc., MBA followed prof. RNDr. Václav Hampl, DrSc. on the position of rector of the Charles University on 1 February 2014. ^ a b c d e f g "Facts and figures（sourced from Annual Report 2016 and Annual Financial Report 2016)". Charles University. Retrieved 2018-04-07. ^ "Opatření rektora č. 31/2016". Univerzita Karlova. ^ a b "Shanghai Ranking: Charles University among 1.5 percent of world's best universities". iForum. Retrieved 2014-08-12. ^ "Description of the Charles University seal". Measuring Health and Disability in Europe. Archived from the original on 11 May 2006. Retrieved 21 June 2009. ^ Charles was since 11 July 1346 antiking of Romans, since 26 August 1346 king of Bohemia, since 17 June 1349 lawful king of Romans as Charles IV and from 5 April 1355 Holy Roman Emperor. ^ "Littera fundationis Universitatis Carolinae Pragensis" (in Latin). 7 April 1348. Herbermann, Charles, ed. (1913). "University of Prague" . Catholic Encyclopedia. New York: Robert Appleton Company. ^ Chyský, Václav (March 2005). "Sedmdesátileté výročí insigniády z jiného pohledu". CS Magazin (in Czech). Retrieved 21 June 2009. ^ Prague; Universität, Bohemia (1834). Album, seu Matricula Facultatis juridicae, 1372–1418, e codice membranaceo illius aetatis nunc primum luce donatum: Codex diplomaticus universitatis ejusdem (in Latin). ^ "KOLÍN (Kalina) z CHOTĚŘINY Matouš (Mattheus Collinus a Choterina)". KDO BYL KDO v našich dějinách do roku 1918 (in Czech). ^ a b "Timeline of Charles University in Prague". Charles University. 12 June 2006. ^ Čapka, František (1999). "VII. Vláda Habsburků a protireformace". Dějiny zemí Koruny české v datech (in Czech). Prague: Libri. ISBN 978-80-85983-67-8. Retrieved 21 June 2009. ^ "History of Charles University" (DOC). Charles University. 18 May 2004. Retrieved 21 June 2009. ^ "František Pelcl" (in Czech). Institute of the Czech Language of the Academy of Sciences of the Czech Republic. Archived from the original on 5 February 2012. Retrieved 17 March 2012. ^ Čapka, František (1999). "VIII. Od osvícenského absolutismu k národnímu obrození". Dějiny zemí Koruny české v datech (in Czech). Prague: Libri. ISBN 978-80-85983-67-8. Retrieved 21 June 2009. ^ Čapka, František (1999). "X. Směřování k samostatnému státu". Dějiny zemí Koruny české v datech (in Czech). Prague: Libri. ISBN 978-80-85983-67-8. Retrieved 21 June 2009. ^ "Johannes Urzidil – život – chronologie" (in Czech). Společnost Johannese Urzidila. Retrieved 21 June 2009. ^ "Národní shromáždění československé 1918–1920, 43. schůze, část 2/10". Společná česko-slovenská digitální parlamentní knihovna (in Czech). 8 April 1919. ^ "A brief history of the Protestant Theological Faculty of Charles University". Protestant Theological Faculty of Charles University. 12 March 2009. ^ "Národní shromáždění československé 1918–1920, 105. schůze, část ⅜". Společná česko-slovenská digitální parlamentní knihovna (in Czech). 1 January 1920. ^ "Registries of the German University in Prague". is.cuni.cz. ^ "History of Charles University". www.cuni.cz. Charles University in Prague. Retrieved 23 March 2015. ^ "Zákon o přeložení sídla německé university v Praze" (in Czech). Senát Národního shromáždění. 16 December 1921. Archived from the original on 19 July 2012. ^ Hlaváčková, Ludmila (December 1994). "Německá lékařská fakulta v Praze (1883–1945)". Vesmír (in Czech) (73). ^ Čapka, František (1999). "XI. Léta první i druhé republiky a protektorátu". Dějiny zemí Koruny české v datech (in Czech). Prague: Libri. ISBN 978-80-85983-67-8. Retrieved 27 June 2009. ^ Svoboda, Petr (2005). "17. listopad 1939 je opředen mýty, říká historik Petr Koura". IForum (in Czech). Charles University. ISSN 1214-5726. ^ Chalupský, Josef (December 2002). "17. listopad 1939". Zprávy ČPS (in Czech). Česká Parazitologická Společnost (4/10). ^ "History of CU". Cuni.cz. 2014-04-04. Retrieved 2014-08-12. ^ "A University Fit for a King". Prague-life.com. Retrieved 2014-08-12. ^ a b "QS World University Rankings 2019". 2018-05-29. ^ a b "World University Rankings". 2017-08-18. ^ Chau, Abby (2011-09-20). "QS Intelligence Unit | Eastern Europe and Central Asia in the 2011 QS World University Rankings". Iu.qs.com. Retrieved 2014-08-12. ^ "Central & Eastern Europe | Ranking Web of Universities". Webometrics.info. Retrieved 2014-08-12. ^ "BRICS & Emerging Economies Rankings 2014". Times Higher Education. Retrieved 2014-08-12. ^ a b Scimetrica, www.scimetrica.com – © 2014. "Charles University Prague, Czech Republic – Institutions". UniversityRankings.ch. Retrieved 2014-08-12. ^ "Charles University belongs among top ranking world universities – First Faculty of Medicine". Lf1.cuni.cz. Retrieved 2014-08-12. ^ "Charles University Rankings". Top Universities. Retrieved 2014-08-12. ^ "Charles University in Prague in World Top 500 Universities". Shanghairanking.com. Retrieved 2014-08-12. Wikimedia Commons has media related to Charles University in Prague.